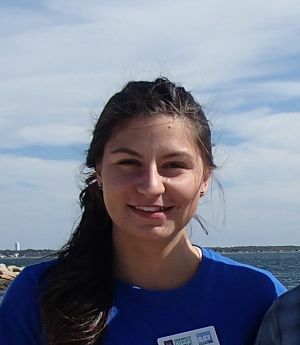 Tanya Creamer is the MassLIFT AmeriCorps Service Learning Coordinator hosted by the Wareham Land Trust and Buzzards Bay Coalition during the 2015- 2016 service year. When I began my year of service with the Wareham Land Trust in September; I came into it with a wonderful familiarity of Wareham, the community of people who lived here, and the amazing natural resources the area has to offer. My position as a Service Learning Coordinator with the MassLIFT AmeriCorps program provided me with the perfect opportunity to do what I love—teaching and being outside! I’ve been very busy since I started in September leading outdoor exploration programs with families and students from all over the region. By the end of October, I had completed one of my major goals for the year and had one of my best teaching experiences. Thanks to the help of dedicated Grade 3 teachers at Minot Forest Elementary school, I was able to lead programs with all nine Grade 3 classes. That’s a total of about 200 students! With some help from fellow MassLIFTer Kari Amick, we successfully lead every student on an outdoor exploration program through the nature trails at Minot Forest. I enjoyed teaching this program so much because so many remarkable students came ready for an adventure. 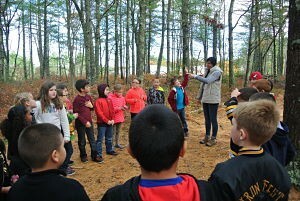 From the moment they stepped foot on the trail, each third grader was so wide-eyed and excited that they could barely stand still to listen to my introduction of the activity. I started off each class by asking: “Who has been on the Minot Forest trails before?” Only one or two students would raise their hands. It shocked me that they could have a beautiful forest path right next to their school and not have explored it before. This is exactly one of the reasons why I want to lead these types of programs. Hands-on experiential learning is sometimes the best way to engage the most unruly of students and I saw this proven again and again during each class. As I lead each class along the trail, I asked them to keep their eyes and ears open and make observations of the life they saw. I heard exclamations of “Oh my gosh, look at that!” and “Ew gross, what is that thing?” continuously during the walk. We stopped in a clearing and did the first activity. 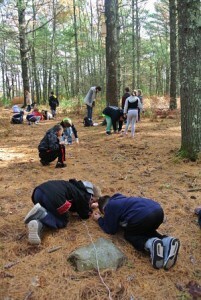 A “Macro and Micro Hike”, has students looking at the big and little, living and non-living things they could find on the trail. The macro things they found easily, but when we passed out magnifying glasses to help them search for micro things, they became even more engaged, bending down to hold the tool close to the ground, studying the earth beneath their feet. Then shouts of “Look at this, look at this!” brought all the students rushing over to the spot to look at the spider or beetle or piece of moss they had found. The natural environment can often gain the attention of students better than any teacher ever could. We walked down the trail until we came to the part of the path that borders a swamp. Here I talked with the class about the concept of a habitat and what an animal needs in its habitat to survive, such as food, water and shelter. I then told the students that they would work with a partner to build their own habitat for an animal that would live in either a forest or swamp habitat. I could barely tell them only to use materials they could find along the path and give boundaries before they rushed off in search of resources. The pairs collected sticks, rocks, dead leaves and pine needles. Each group had a different and unique vision for what their habitat should look like. Some were sticks stacked together in a triangular shape, others were holes in the ground covers with pine needles, and still other were big branches leaning up against fallen tree trunks. I think that I (and their teachers) enjoyed watching the students build these habitats as much as they did making them. The purpose of my position and the MassLIFT AmeriCorps program and the Wareham Land Trust is to engage the community in land conservation. By leading these students on this outdoor exploration program, they were able to explore the nature trail and enjoy it in a safe, structured environment. I hope that I helped to build their confidence so that they will want to go explore the natural resource that is Minot Forest again and again.